You are here: Home / Topics / Get On-Time / Keep ‘Back Foot Sideways’ Like Robinson Cano? Keep ‘Back Foot Sideways’ Like Robinson Cano? I wanted to do a follow up on the Matt Nokes post from a few weeks ago. So I decided to do a short video (I know, a rarity these days :-P), seeing if I could bring some clarity to the issue. When looking at video, the chest view IS NOT helpful. Look for pitcher’s, catcher’s side, or over head views. The principle is to get the pelvis (or hips) perpendicular to impact, NOT to the pitcher. The back foot skips in some cases, and not so much in others. 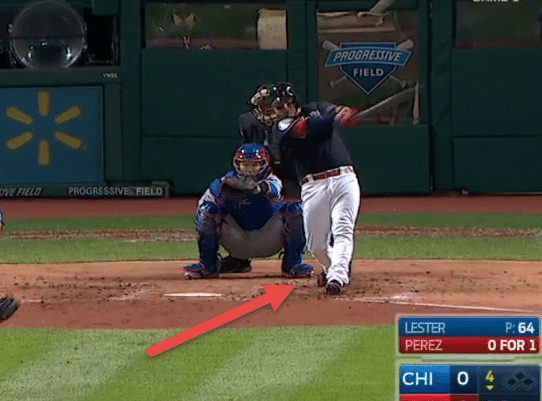 I’ve seen it skip away from home plate, toward the front foot, and toward the plate (not as often). In other words, you don’t have to have one without the other. What may also help are these two shifting foot pressure videos (Mickey Mantle AND RopeBat). The sideways back foot will deviate slightly depending on an inside v. outside pitch. This falls in line with this post on the 90-degree to the spine rule. In YouTube, search “[favorite player’s name] 2016 highlights”, and watch the behavior of the back foot at impact, and make note of batted ball direction. Also, it doesn’t seem ONLY .300 hitters do this because Roberto Perez, in the images above, is a career .220 hitter. My observation is the back foot acts like a “governor” to the rotation of the hips. It’s like it helps anchor down the back hip from over rotating the impact zone. Doing this helps to align the body on the plane of the pitch better, and may cut down on rolling over versus a full rotation of the hips, on every pitch. https://hittingperformancelab.com/wp-content/uploads/2016/10/roberto-perez-1st-homer-wsgm1-lf.png 401 542 Joey Myers https://hittingperformancelab.com/wp-content/uploads/2018/05/hitting-performance-labs_c90c0362088ef1d3d528f3078f4f8ac1.png Joey Myers2016-10-27 01:17:032018-07-24 05:06:11Keep 'Back Foot Sideways' Like Robinson Cano? I agree 100% Gavin. Causation does not necessarily equal correlation in most cases. If I wear a green shirt and it rains three days in a row…wearing the green shirt doesn’t make me a “bringer of rain” 😛 We have to strike at the root. I think awareness of the belt buckle is a good place to start. Although with different learning styles, that may not work for other hitters. What I find, even with “Feel” learners, them getting a concept can mean using a different area of the body as a cue. In other words, ‘belt buckle’ may work for one but not another…and for the latter, they may like keeping the back foot rooted. It all depends on the hitter and your approach. Sometimes it may take 2-4 cues in a session to finally unlock the pathway to power for a particular hitter. Damn it… Tried to make it short… Sorry.. Hopefully a different angle on the same thing… Great article Joey… By far something that I don’t think anyone is discussing or even noticed… This is by far really important given the current culture in teaching the swing….I think looking at the knee direction right before release is important… And how we direct that knee is like a magic trick while if we don’t notice the foot screwed in and the angles of the knee, ankle and the flexions in the knees and ankle it can be missed… So there’s an inherent bow to all that which is set in the stance to make the hip hinge,… Etc… Work… Damn it I did it again… Alright I’m out… Again… I think this was a short one but one of the most important articles you have done given what I’m seeing on the field… Peace out!!! Djura, I agree 100% man. Great thoughts on the matter. Get a calculus teacher on here to talk about vectors. I think that the answer lies there. Great! I think we need an expert opinion here as we are delving into some heavy stuff – just to hit a baseball, no less! I shave my question ready. I don’t think it’s that complicated… If you played basketball and did the drill where you plant your rear foot and exploded the other way… Do that and let your tesr foot screw in and than explode in any direction… That direction dictates what angle the foot applied pressure to the ground… Additionally, the screwing of the foot applies pressure… The direction is from the core… Pelvic or pubic bone push… Let the foot do its thing… Don’t rotate the torso… Watch the foot … Well if your not rotating your torso or swinging a bat your lead hand and its bottom 3 is not really moving… Than do it like your swing a bat… Well if your connected the turning of the foot correlates to the turning of your lead hand… And Joe you said the hands just hold on to the bat and go along for the ride… Well in case if your connected correctly than the back foot does too… But like I’m trying so hard to get accross is the hands are active and so are the feet but I’ll not get into that… My lead hand is really active and my rear foot is really active… So they are active at times and go along for the ride at times…Said another way…. I use the fact that the feet to knees, knees to elbow and elbow to hands can be separated and tied back to hit square and I can do it when I want to… So I’m dictating it all and with practice it’s easy… So I basically directly ( I mean I’m thinking to do it) touch the ball with my bottom hand and compress ( indirectly) the ball with the top hand (the compression is indirectly because of the force couple in fact already sets the top hand though and the fact I’m using my armpit and elbow as one unit and just holding that position with my top hand)….so it’s like touch here and yes it all happens naturally meaning it naturally happens if you set it up and let it happen… Said another way is it’s the natural way the body flows if you know how to do it… Meaning there’s nothing naturally about it as its learned by feel and staying away from nonsense cues… Like the ones Joey is trying to debunk… Off course we don’t OVER rotate our position when hitting… Of course we dont get disconnected… Of course if we are connected we don’t turn our center of mass and by default our hands with our foot… Of course when we are READY to use our center of mass as a source of power to hit across our chest with the angle Joey mentioned before ( Ohhh basically in our hitting position) we don’t use our feet or miss or EXIT…. Man Joey I learned a lot from you, Thomas Myers and just reverse engineering my stick ball swing… I remember a long time ago you telling me to gather my thoughts and to read Anatomy Trains… Well I read most of that book and I’m trying to gather my thoughts the best I can…I’m starting to think I’m really seeing the big picture and it’s only because I can see and feel the particulars and stand back and see them all fall in place….All I can say is what I knee 2 years ago I thought was a lot…now I know that 2 years ago I knew nothing… That IS amazing because now I’m thinking what do i know…? Djura, interview coming soon. I’ll have to contact him and see if he’ll be up for it. I’ll do it similarly as the Dr. Nathan interview, where I’ll ask readers to submit questions, and let him answer them via video, audio, or written. I assume he’s a busy guy, so hopefully he agrees to do it. My 13-14yo, last year, had a coach pretty much teach this approach but he over-emphasized the movement of the back foot… leading so many of the guys to purposefully skip the foot backwards that they lost track of the real goal (getting the hips perpendicular to the ball at contact, unweighting the back foot and finishing through the ball, slightly upwards through it’s downward pitch path) and the method didn’t really work for most. Totally Alan…losing sight of the forest for the trees 😉 The key is getting the center mass of the body (be it belt buckle, sternum, or nose) to center up to impact. Here’s Baez’s Game 7 HR. NoTice when he skips the back foot. Why? Watch where his head and upper body goes. Joe, Baez definitely gets more twisted up than others and his back foot skipping away from home plate looks similar to Hank Aaron and Miguel Cabrera going to the same side of the diamond. What did you think of where the head and upper body went? Joey Baez hit a 400 foot shot shot he left some off right… Well it depends where he hit it but let’s say he left 75 off from leakage… So if you follow me and think he left some off than the question isn’t was that a rocket but where did the rest go… Assuming pretty go mechanics… ASSUMING… For sake of discussion… The back foot is 3-DIM… Multiple movements… So let’s just name two… Linear and rotary… It looks like his foot is trying to help him hit accross his chest than in the last second spins which leads to the foot not grasping the ground and actually slipping… Obviously he already had an enormous amount of pressure but the spinning lead that pressure to give…Said another way… That’s at least one spot where he leaked ? Hope all is well and Happy Thanksgiven Brother!! !